Do not switch on the ignition or start the car to avoid damage to your engine. Push your car in neutral to a safe place and call WRONG FUEL DOCTOR. 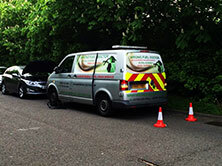 Our qualified technicians will be with you within an hour to drain the fuel and get you back on the road. WRONG FUEL DOCTOR has a “no start no fee policy” so we will not charge you for any of the work done. WRONG FUEL DOCTOR’s technicians and specialised equipment are suitable and capable to remove the wrong fuel from any vehicle type. 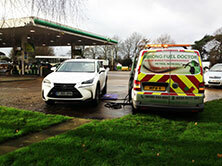 WRONG FUEL DOCTOR’s network of professional and qualified technicians cover all of the UK. We also work with a number of other wrong fuel companies who we would put you in contact with if we are not able to assist in this instance.